Black T-Shirt with "Bokkereyder" on the front (right chest) and Logo on the back. Size S.
Black T-Shirt with "Bokkereyder" on the front (right chest) and Logo on the back. Size L.
Black T-Shirt with "Bokkereyder" on the front (right chest) and Logo on the back. 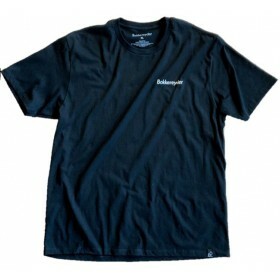 Size M.
Black T-Shirt with "Bokkereyder" on the front (right chest) and Logo on the back. Size XL. Black T-Shirt with "Bokkereyder" on the front (right chest) and Logo on the back. Size XXL. Grey T-Shirt with the "Méthode Goat" Logo on the front. Size L.
Grey T-Shirt with the "Méthode Goat" Logo on the front. 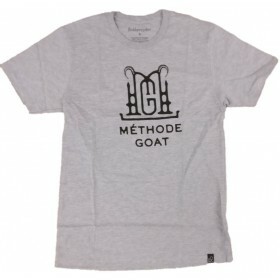 Size M.
Grey T-Shirt with the "Méthode Goat" Logo on the front. Size S.
Grey T-Shirt with the "Méthode Goat" Logo on the front. Size XL.